Caribbean GeoTextiles' Tubes and Bags are environmentally friendly and fast becoming the most popular method of Hurricane Storm Protection, dewatering surface water of open-pit and underground mines in the Caribbean. The UV resistant, high strength woven fabric is can catch fines from effluent before they discharge into ponds, streams. 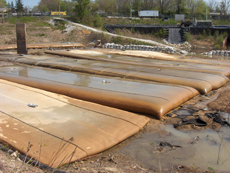 GeoTextile tubes and bags are relatively inexpensive to purchase and install as compared to the much more expensive method mechanical processes for Hurricane Storm Protection. And, as an added benedfit to the mine owner, using geotextile tubes and bags can help capture enough material to offset the cost of separation.